No, it’s not a typo. There are two reasons why this new swanky hip spot is missing an ‘H’ to its name. Reason one being management didn’t want guests to say, “Let’s meet at the hotel lobby” and then be confused as to which hotel this would mean. 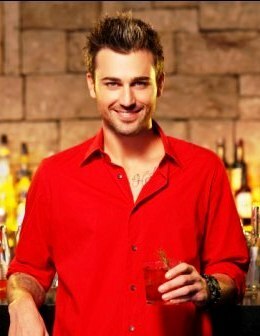 Reason two would be that their resident Master Mixologist, Benjamin Browning, is from the U. S. of A. and isn’t a fan of pronouncing the ‘H’. Us Brits won’t judge you, we promise…. The concept of this trendy gastro pub is exactly as it says on the tin—a hotel lobby. When you enter, you meet a reception desk where the DJ spins in the evenings, watched over by a magnificent hanging spider-esque chandelier. On reception there are fresh red apples in a bowl for guests to get a rush from when slipping one in their purse while nobody’s looking. 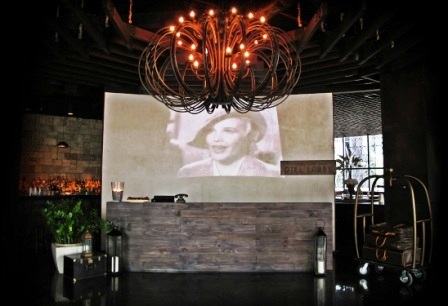 Behind the reception desk, a white curved wall is projected with black and white movies, which is unique to this city. Black is everywhere, radiating the masculine sexiness of this Lobby—the walls are black, the floor is black and the ceiling is black. 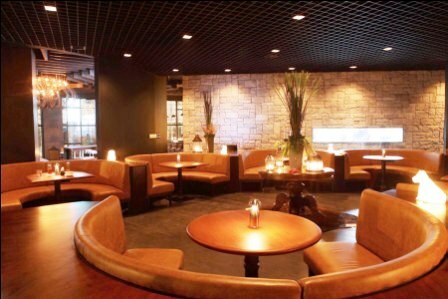 To the left of you a stunning bar and to the right a 120 seating capacity restaurant with a section on a slightly elevated area with round rock n’ roll yet chic diner booths and leather sofas. It’s evident that a lot of thought went into designing and building Otel Lobby and influences seem to come from all across the globe. So, who are the masterminds behind this new restaurant? Two ladies, yes ladies. 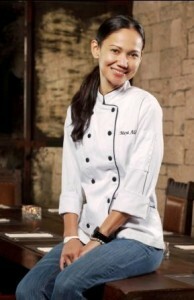 Head Chef & Co-Owner, Maya Aldy. The gorgeous Maya Aldy, Head Chef and Co-Owner, and Gaby Bakrie, Restauranteur, Publisher and Humanitarian. This dynamic duo wanted to create a place that serves good food, good drinks and a good place to have a good time with friends and family with excellent service, meaning they should never really say no to any request—except six foot something Browning who will deny you a drink if you’re staggering up to the bar and slurring your words, so stay on the ball, folks. Browning has 12 years experience in the hospitality industry, working with names like Jose Andres in Beverly Hills and Word of Mouth in Bali, making this team unstoppable really. Watch this space. If you want to try the best cocktails in the country, come here. If you don’t agree that their cocktails are the best, I want to hear from you. Shaken for 6 seconds only, my Burning Mandarin (served in a Martini glass) was a phenomenal mix of Mandarin Vodka, fresh lemon, orange and chilies. The final sip gave me a good kick up the backside. We also had the Herb n’ Bourbon (pronounced Erb n’ Bourbon by Browning), a blend of rosemary, mint, basil, fresh orange, lemon, honey, Angostura Bitters and the almighty Jim Beam, served with hand-cut ice so as not to dilute the drink. It’s like a party on your tongue and you’re invited. I also sampled the amazing home-brewed cider. Yes, you heard right, cider is available in Indonesia! I have always loved cider with a passion, and find it so frustrating that it isn’t available anywhere here. Now life is complete. The food menu is small, but that isn’t a bad thing. 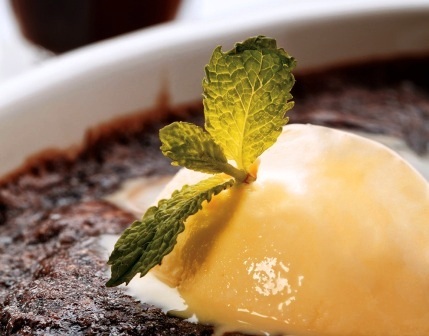 Mains include Beef Wellington, Tenderloin Steak, a Mushroom Duxelle wrapped in puff pastry and Oxtail Soup, all at extremely affordable prices. It’s refreshing to come to a nice place that doesn’t hike up the prices just for the privilege of being in the venue. Almost all the ingredients are local, a policy of Maya’s and she hopes this will become a trend that more restaurants consider in Indonesia. Let’s hope this vision becomes a reality. Then there came the desserts. We sampled a delicious, moist Banana Cake with caramel served with a shot glass of frozen milk and a mini straw followed by a Chocolate and Cherry Pudding with chocolate sauce and luscious homemade ice creams, homemade being the operative word as everything at Otel Lobby is made from scratch. If you get cold, the staff will hand you a pashmina and if you struggle to read the menus, you’ll be given a pair of reading glasses. This is customer service. The Lobby will have a special Christmas menu, which you can enjoy along with their beautiful hot cider on Christmas Eve or on Christmas day for brunch. 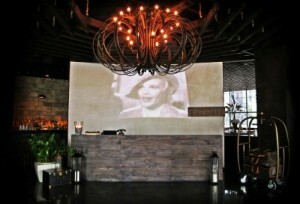 For those partygoers out there, why not try this chic spot for New Year’s Eve? If anything, come to check out the originality of the interior and take advantage of their weekday happy hour, offering 2 for 1 on cocktails and appetizers. A win win for everyone! Check in to the Otel. You don’t need a key.